This latest addition to the world of cowboy dating sites seems promising. Cowboymate.com is still very young and therefore doesn’t have that many users yet, but the creators seem to be doing a good job at attracting them. Cowboy Mate is a place that caters to people who truly enjoy the country and western lifestyle and it shows from every page, category, header and button on this website. And that’s a good thing, of course, because every user wants a site that has him or her in mind. Another impression we get from visiting this website is that it’s very easy to navigate, unlike some other sites of the same kind. What kind of design would you normally expect from a dating site specialized in people who are into cowboys, country music and rodeo? Well, a lot, since that lifestyle has plenty of iconic images and symbols. However, the creators of Cowboy Mate opted for a less flamboyant, more toned down appearance and only placed one classic cowboy symbol on the site – a gun, of course. Other than that, it’s just mellow beiges and reds, blacks of course, and a western font. In our opinion, they made a good call, since people go to the site not for the flashy design but to find dates. The site is very easy to navigate and all the essential elements, categories and options are right there in front of you. If you hate having to spend tons of time looking for a basic feature that the designers hid somewhere in the chaos of the interface, then this is the place for you, because that will never happen. So, what is it that Cowboy Mate offers to its users? Well, it has pretty much everything you’d expect, and not much else. The site does not surprise and does not awe with cool features but it has everything you need. Browsing and searching for users is quick and easy and if you sign up for a premium account you get even more options to customize your search and get better results. Premium users also have the option of sending unlimited flirts and messages, like users and see who’s looking at their profile. There is also the option of seeing who’s online and inviting them to chat, if you prefer more immediate communication. Messaging if free, quick and easy, with an inbox placed right in the center of the main tab on the site. Users can update their profiles by filling in quite a detailed questionnaire, designed to optimize the user interaction, which is very useful. Another fun feature on this dating site is the option of updating your status, like on all major social media sites, which is not something we get to see very often on dating sites. As we mentioned earlier, Cowboy Mate is only just starting, so you can’t really expect it to have the biggest membership base out there. But still, it already has plenty of users, enough for you to have a variety of different cowboys and cowgirls to choose from and start a friendship. More importantly, these folks are really into the country western lifestyle, which is plain to see from their profile info. You can put down all the things you’re interested in, from music to literature and movies, which helps you find people who share the same interests. The same goes for political and religious beliefs, which is equally important. Day or night, rain or shine, there’s always someone online to chat with on Cowboy Mate. 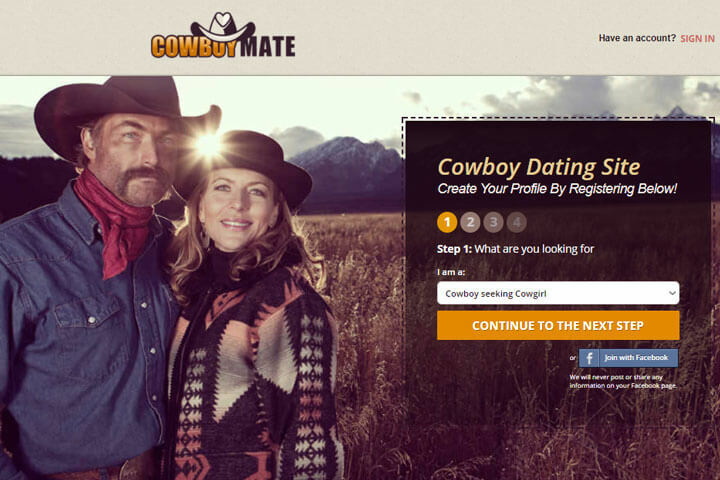 Given a little time and patience, this site will definitely become one of the top places for cowboy dating. As for the male to female ratio, for now it seems that the ladies looming for handsome, rugged cowboys are in a slight majority, but that doesn’t mean that men looking for ladies with a taste for the country western lifestyle can’t find a great match here. One thing that needs to be improved, however, is the fact that not all members have photos of themselves uploaded to their profiles. 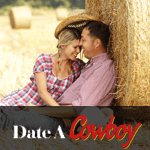 Cowboy Mate is a good place to start if you want to meet cowboys and cowgirls in your area. It’s not the best nor the biggest cowboy dating site out there, but it’s functional, doesn’t have a lot of bugs and doesn’t crash, and it’s user base just keeps growing. I appreciate someone made a site for cowboys, but I would love if there were a bit more people. There isn’t much to do here after some time, if you didn’t find someone to chat with daily. I haven’t got much date, but flirting is nonstop, that is fun. I’ll try and pay for the premium membership, see what happens. Loved the site and loved the ladies, so open and ready to talk. It makes me feel less lonely and that was why I signed up in the first place. So far so good. Website reminds me of Facebook and Tinder at the same time. I love that I can post statuses, it feels like people can know more about me from them. Everything works pretty well, a big plus, because there were other sites that just bugged all the time and annoyed the hell out of me. Nothing to reproach, keep em coming. Gals love cowboys, always was, always will be. I found many interesting women here, even more then I thought I would. Many matches to choose from and choosing is so much fun every time! Will stay here for a while. I didn’t come to dating sites until recently, but now I know I should’ve. I had a few great dates with one great lady, hopefully it will happen again. So far, thanks to Cowboy Mate!